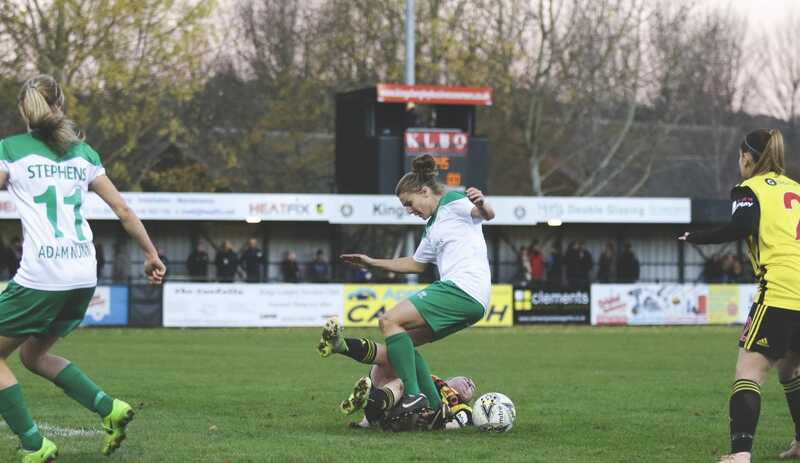 Chichester City Ladies and Watford Ladies went toe to toe in a physical battle that saw two players carried off. 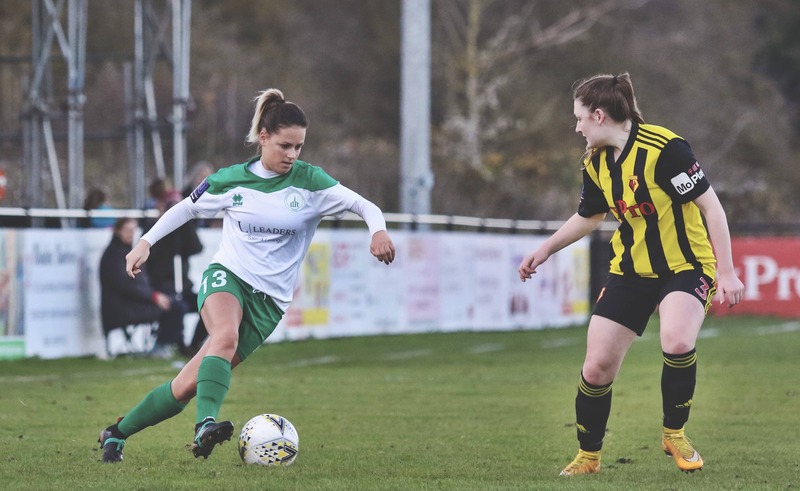 At the final whistle, it was Danielle Scanlon’s goal that separated the sides in the FA Women’s National League Southern Premier. Watford’s captain Helen Ward proved threatening early on getting into dangerous places including putting a low cross into the box for Katie O’Leary who wasn’t able to get to the ball. It was an even game with both defences keeping the attacks at bay, Lauren Peck saw out a cross from Nadine Bazan shortly after Tiffany Taylor headed clear the Watford left back’s cross. With 15 minutes on the clock, the hosts broke the deadlock from an Alysha Stojko-Down free-kick. The midfielder whipped the ball towards goal with Lauren Dolbear saving and Bazan went in low to clear the ball, but her clearance was denied by Scanlon as the bounced off the Watford player and into the empty net. Cherelle Khassal won a free-kick for a slight clip on her heels while driving through into the box with Hollie Wride taking the set piece and forcing Weronika Baranowska into a fingertip save, pushing the ball over the crossbar. Ward had the home supporters cheering again as she placed her shot into the bottom corner, but it was quickly hushed by the raised flag of the assistant referee. The hosts were forced to make a sub before the break as O’Leary was carried off and replaced by Linda Afuakwah. Jess Lewry came on at half-time for Chichester as Aaron Smith looked for a spark in his team’s performance and it looked promising. Lewry was leading the line and causing trouble in the Watford area setting up Wride for a low strike that was covered well by Baranowska. It would be short-lived though as Lewry took a knock on the ankle. A strong tackle by Georgie Edwards would see the forwards game end after 13 minutes and be replaced by Jade Widdows. Before the injury there was a heart in the mouth moment as Dolbear flew out of her goal to clear the ball from the feet of Ward but missed however, the experienced Waine was quick to react and clear. 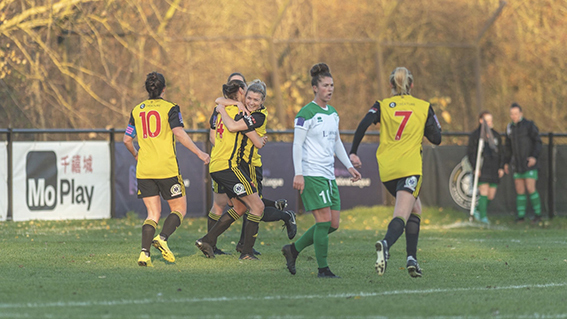 There was another forced substitution in the game as the challenges became more physical with both teams battling to win the game; Watford’s Andrea Carid was replaced by Laura Baker. On target efforts weren’t as easy to come by for Chichester as they had been the previous week, Khassal teed up Wride who’s shot went wide and Molly Clark had her shot blocked. Despite their lead Watford weren’t creating much themselves and made Dolbear diving low to her right as Leanne Bell struck on the turn. Substitute Jade Widdows had a great chance just inside the Watford box but her strike was deflected over the bar by the Watford defence. The time ran out as Chichester strived for an equaliser, but it wasn’t to be, even after eight minutes of stoppage time. Watford: Baranowska, Peck (Akerman), Hill, Edwards, Huggins, Scanlon, Stojko-Down, Carid (Bell), Ward (c), Bell, O’Leary (Afuakwah). Chichester City: Dolbear, Cheshire (c), Taylor, Wride, M Clark, Stephens, Khassal, Waine, Barron (L Clark), Simmonds (Lewry) (Widdows), Bazan.